In September 2015, the service westbound from York Mills was quite erratic at all hours as shown on the following chart. The first five pages show the data for each of the five weeks in September by day and include trendlines threaded through the datapoints. Although the trendlines stay close to each other indicating that, overall, the headway values (intervals between buses) average out similarly for each day, the individual values are scattered considerably from the target values. The situation for the month as a whole is shown on page 6 where there are many quite short, but also a substantial number of quite wide headways. The situation on weekends (pp 7-8) is even worse. The values are summarized with averages and standard deviations (pp 9-11). The SD values are consistently at 5 minutes or higher indicating that a substantial number of the headways lies in a band 10 minutes or greater wide. This is utterly beyond the TTC’s stated goal of service leaving terminals on time and, by implication, regularly spaced. This is especially problematic when scheduled service runs infrequently and another bus is not just a few minutes away. Although the schedule summary shows the effect of blending the 96A, 96B and 96C services, in fact this blend is designed not to work at all because the 96C usually operated on a headway that did not mesh with those of the other services. For example, weekday midday service was every 15 minutes on 96A and 96B (producing in theory a 7½ minute combined service), but the 96C came once every 32 minutes and thereby had no relationship with the other services. By March 2016, the service was somewhat improved, although far from perfect. In March, there are far fewer headways over 20 minutes and also fewer very short headways with two (or more) buses leaving York Mills Station together. The SD values generally lie at about 4 minutes rather then 5, although neither of these keeps the service within the TTC’s target. Weston Road North is little better than Wilson, and shows a similar pattern for its headways in March 2016. In April 2016, the “96” service consists only of the 96A and 96B branches. In theory, one would hope that the simplification of the route might lead to more reliable service, but that is not what actually happened. Although very short weekday headways are uncommon (little bunching among the 96s), headways above 20 minutes (twice the typically scheduled value) have become more common again. Weekends, especially Saturdays, show a great deal of bunching with short headways leaving York Mills Station throughout the afternoon. Meanwhile, the Weston Road North service continues its pattern of erratic headways and bunching. When the two services are view on a combined basis, the average headway is lower, but the reliability still leaves a great deal to be desired. Note that route “965” is a fictitious number I concocted for the consolidation of the two routes’ operations. The headways, both scheduled at about 10 minutes, do produce a 5 minute average, but the actual values are scattered over the 10 minute range. The “blending”, such as it might be, is entirely accidental particularly on Saturdays when the SD and average values are often nearly the same. Meanwhile on the 186 Rocket service to Humber College, service is erratic with an SD value of 4 minutes or more, although poor performance early in the month improves in later weeks. With its off street bus loop, Wilson Station is a point where ill-spaced service could be re-martialled into a regular headway. That is not what happens, however. As at Yonge Street, headways in September 2015 ranged from zero to 20 minutes, and the standard deviation is high enough that this service cannot possibly meet the TTC’s on time performance target. In March 2016, the situation is similar, but there is a marked improvement during the final week of the month when short headways generally vanish. The Weston Road Service operated on the same schedule through March and therefore shows no change in the last week. The day to day trend lines are consistent, but they hide a variation in headways only slightly better than on Wilson itself. In April 2016, the services are operating under their own route numbers. Wilson 96 headways remain scattered over a 20 minute range, and the SD values are at best about 4 minutes, hiogher notably on Saturday. The Wilson Rocket’s headways are somewhat better behaved with a slightly lower SD value, but still not below the three minute line where service has a fighting chance of being “on time” much of the time. Weston Road North, as at other points on the route, has headways scattered across a 20 minute range. As for the “blended” service on Wilson and Weston Road North, in fact the SD values for the combined services are almost equal to the trend values (typically the combined scheduled headway). 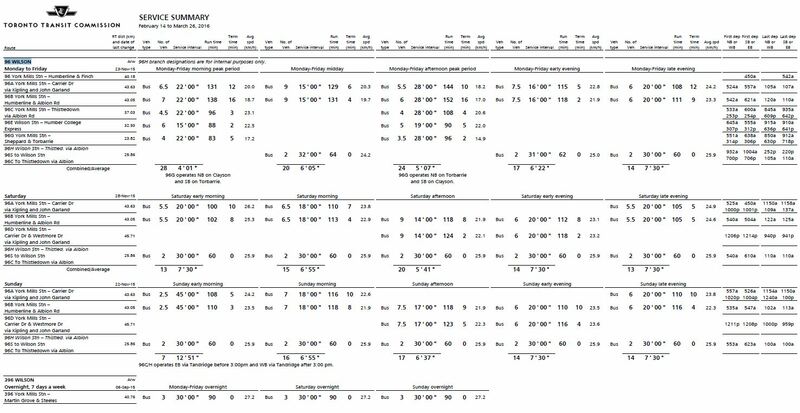 This indicates that many buses operated in pairs on Wilson Avenue rather than providing the alternating 96/165 service that is intended. In September 2015, service on the 96A inbound was erratic with SD values of 5 to 10 minutes (and above) at all times. By March 2016, the situation was little different. With the new schedules in April 2016, the SD values have finally dropped, but still not to a 3 minute level. The situation on the Clairville branch is similar to Carrier with headways that vary considerably and SD values producing service beyond the target range of headways. At Kipling, the two services have joined and should be providing a blended inbound headway. In practice, the SD value lies between 4 and 5 minutes, and for a 10 minute “blend” this will lead to gapping, bunching and uneven loads on buses. In September 2015, the Thistle Down service was a branch of the Wilson route. The scheduled headway was quite wide, near 30 minutes during most periods. The SD values for outbound headways are quite high, and they are little better for inbound service. This shows that the benefit of a terminal where recovery to “on time” might occur had little effect. A 10 minute SD is quite high, indicating that a considerable amount of the service ranged up to 20 minute headways, and the timetable was effectively meaningless. By March 2016, service to Thistle Down had improved, and the SD values were down to 5 minutes weekdays and Sundays, although Saturdays continued with 10 minute and worse values. These values would still give very erratic service, but only slightly less so that in the previous September. Finally, in April 2016, the route was operating on its own as 118 and should have been free of disruption from other interlined operations on the 96. However, the actual service looked similar to the uneven headways we had seen when it was not a separate route. This shows quite strongly that left to its own devices, an independent service on a wide headway will operate very unreliably. This speaks volumes both to the operating ethos of the drivers and the laissez-faire nature of route management. Infrequent routes must operate very close to schedule because simply waiting for the next bus to show up is not an acceptable practice for riders. 119 Torbarrie is a peak only service, and it did not operate particularly reliably when it was part of 96 Wilson. As for the independent route, the actual reliability is summarized by a scatter map of the headways for all weekdays in April 2016 as seen at Dufferin westbound (not far from Wilson Station), and at the south end of the Oakdale Loop. 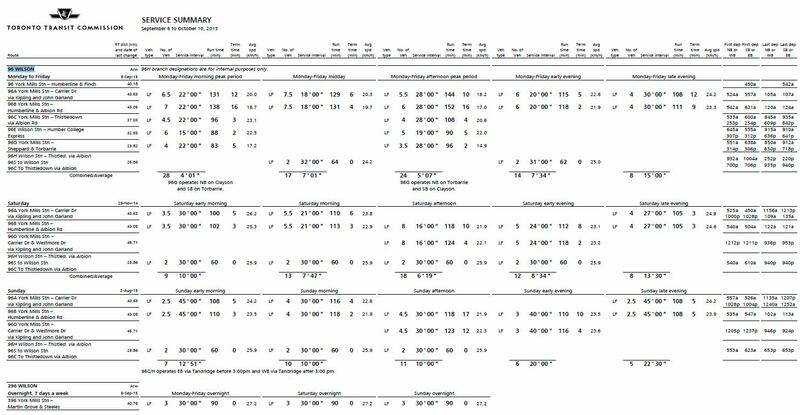 The number of headways showing here at about twice the scheduled value, especially in the PM peak, suggests that not all runs actually operated on all days. On a short route with a wide headway, this can have a large effect on the time riders will wait for a bus to show up. Once the 165 branches off from Wilson Avenue onto Weston Road, reliability of service becomes more important because there are no other routes to fill in the gaps. However, the 165 operates with a range of headways wide enough to guarantee service that is more irregular than the TTC’s target value. Northbound at Sheppard, headways vary over a range of 0-20 minutes with SD values typically around 6 minutes, double the value that would be seen if service were “on time” by TTC standards. The situation is slightly better southbound south of Ormont (the southern end of the loop at Steeles), but still with SD values above 3 minutes as service leaves the terminus. Most service on the 165 turns back at Steeles, but a limited number of trips operate into York Region. The charts below show the headways just north of Steeles, and they reveal a “service” that differs quite substantially from the regular spacing one would expect on a very infrequent operation. The concept of “on time” is quite impossible here where SD values of 10 minutes are not uncommon. This is service that operates when it shows up, not on any predictable schedule. Click on the summaries to view them full size. This entry was posted in Service Analysis, Weston Road North Bus, Wilson Bus. Bookmark the permalink. This is your most boring article. I hope that you close this thread for comments before it erupts into a heated discussion on something unrelated like the now infamous proposed Scarborough subway extension. Steve: Yes, it is boring. It was intended as a detailed review of how the problems on Wilson are almost entirely of the TTC’s own making through their unwillingness to manage headways and on time performance, even with revised schedules. That’s what I said at the outset in the little summary for people who don’t want to read the whole thing. Believe me, there are people who will read it all and look at all of the charts. I will be writing about the SSE fiasco separately, and so the trolls will have somewhere to leave their bilious comments, not that I will publish any of them. Steve:It was intended as a detailed review of how the problems on Wilson are almost entirely of the TTC’s own making through their unwillingness to manage headways and on time performance, even with revised schedules. That can be said of every TTC route minus a few that might be affected by construction, accidents, etc at any given time. What the TTC needs is strict disciplinary action against drivers who run on their own schedules and make their own traffic rules like their own speed limits, their own rules that permit driving though red lights and running STOP signs, etc. I am NOT saying that every driver is like that but it’s high time for dash board cameras, real-time monitoring of the locations of all vehicles, etc. Dash board cameras can be immensely useful to investigating accidents and investigating violent crime making for both safer roads and safer cities. Steve: What’s also needed is a change in the management standard that being within a six minute window of schedule is “on time”, and even that only matters when leaving a terminal. As long as the standard is so lax, there is nothing to discipline operators for breaking. The other issues you mention, yes, they need to be dealt with at once. I do find it odd that, not that long ago, the TTC amalgamated 52 Lawrence (West for you modern whippersnappers) and 58 Malton into a 52A, B, C ….G hydra-headed mess. Of course, service on Lawrence is a ragged mess, just like Wilson was and is, with or without the separate route names instead of branches. Perhaps 59 Maple Leaf should become 52M just for fun and giggles. Seriously, these shuffles do nothing. I don’t know how much time the TTC’s service planning staff wastes on this kind of stuff, but don’t they have better things to do? It’s like all the branch reshuffling so that “A” is the primary branch — supposedly. For 110 Islington South, there’s 110A, 110B, and 110C….the primary branch is 110C. For 123 Shorncliffe, there’s 123B, 123C, and 123D….the primary branch is 123C. (123B, which used to be 123, was the primary branch before 123A was replaced by 123D. Clear as mud?) A comment on an on-line discussion board said “this is just screwing around, they don’t have anything to do”, and I have to wonder. Here’s low-hanging fruit I see down at the bottom of Brown’s Line. The 110 and 123 branches serving Long Branch loop arrive and leave at the same time, pretty much all through the weekends, plus a good chunk of weekday early evenings. How much work would it take to offset 123 by a little bit so instead of two buses leaving the loop (and taking riders to the subway) every 12-15 minutes, buses leave every 6-7 minutes? If you just want to get to the subway, you don’t care if it’s the 123 (Kipling) or 110 (Islington), you just want to get there. But it seems that randomly renaming branches, consolidating several routes into one hydra, or beheading one hydra into several routes, is taking up the time of service planners. Steve: Saturday schedules for the 123 and 110 services do not operate on the same headway or a common multiple, and so they will go in and out of phase with each other all day. Sometimes there will be two buses together, other times not. However, on Sundays, the 123 operates every 10 minutes on the :04, :14, etc; while the 110 operates every 20 minutes on the :15, :35 and :55, one minute behind a 123. That said, I have to ask if the majority of travel is from Long Branch to the subway, and how many people would actually benefit from rejigging the schedule. Then there is the whole matter that the buses don’t leave on time anyhow. I would think some people would benefit from a better scheduling, since if you’re heading downtown on the subway the routes are pretty much equivalent (with a slight edge to the “longer” 110 I find). But to the point of perception — and getting back to the subject of this blog post — when buses are frequently observed travelling in pairs by your ‘taxpayer’ types, the thought is “what a waste, the TTC is running too many buses, they need to cut back”. This is especially true of buses departing Long Branch, since neither route is particularly heavily loaded, and if departing pair-wise one might be close to empty. Furthermore, if the buses don’t leave on time, it seems to be done to run in a pair, at least up to Horner Ave.
Steve: You left your comment at 4:15 pm. Here is the scheduled service for this period. This shows how at times there are scheduled pairs, at others not. It is the inevitable effect of a 10 minute headway on one service and an 18 minute headway on another. You should see what departures from a busy station with many routes like Eglinton look like. An issue with the 110 is that half of its service does not go to Long Branch Loop. The headways could be adjusted so that each 110 branch ran every 20 minutes rather than every 10, but this would simply mean that the same scheduled departure patterns from Long Branch would repeat every 20 minutes with 2 123s and 1 110 spread through the period. The 123 pair is not surprising and I see this on routes with service at this level. If one bus is five minutes late and its follower is one minute early, they are within the TTC’s goals for “on time performance”, but the service is terrible. Shorncliffe has already been rescheduled because it was alleged the ops could not make the running time. Sometimes that is a valid point, but not always. A related phenomenon (I see this on the much more frequent streetcar services at Broadview Station) is that pairs of vehicles leaving at nearly the same time do so as a group after the operators finish a joint chinwag/smoke break. None of this will be fixed just by rewriting the schedule. I had to chuckle at Jason’s comment saying that this is Steve’s most boring article – these are certainly not Pulitzer Prize winners, they are necessary to getting a better idea of seeing if anyone is actually supervising service. It’s also the only major trunk route (including its express route) that operate over such a large amount of side streets. Having read many of these related to service that did not affect me (Queen, Dufferin, King), it is good to finally have a tangible set of data to see just how bad service is on my daily route. Service on Wilson is a mess without a doubt, but it certainly feels much improved about a month after the 186 service began, and the local branches began operating on a what felt like a less padded schedule. With regards to spacing out service at both York Mills and WIlson Stations, more should be done – but I feel the lack of layover space at York Mills especially (with buses regularly using random available bays or parking on Old York Mills Road), but also at Wilson Station westbound (as the Dufferin bus frequently occupies all space on the upper level of Wilson Station, and on the ramp from lower to upper), hinders quite a bit in the ability to hold to burn time when running early. What I find happens currently is that buses will dwell at transfer points for an extra cycle or two when running early. When buses are late or bunched however, there is next to nothing done to ensure they are either short-turned or held back. I’ve said it here before, but the only saving grace of transit services on Wilson Avenue are their frequency. Thanks for the write-up Steve, I genuinely do appreciate it.